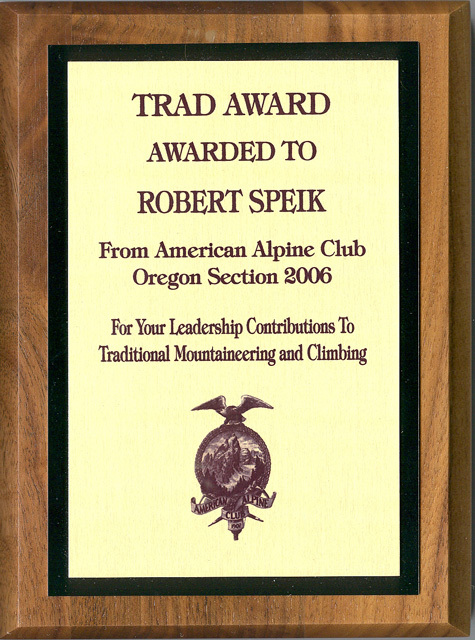 In September 2006, the first Trad Award was given to Robert Speik by Oregon Section Chair Bob McGown at Smith Rock State Park. The Trad Award recognizes individuals for their contribution to Alpine Mountaineering and Climbing through the mentoring of people who become interested in traditional mountaineering and rock climbing. Bob Speik has literally mentored hundreds of individuals. He began as a participant then as a Group Leader in the Sierra Club's Basic Mountaineering Training Course in the 1970's and became Chair of the Mountaineering Training Committee of the Angeles Chapter of the Sierra Club, overseeing both the Basic and the Advanced Mountaineering Training Courses, through the mid 1980's. These training courses introduced up to 1,000 students each year to the summits with the help of 250 to 300 Volunteer Leaders who were formally qualified in four levels of expertise and responsibility, all teaching basic and advanced mountaineering in five large geographic areas in Southern California. Bob served also on the Angeles Chapter Leadership Training Committee and the Chapter Safety Committee. While raising a family of three and managing a business career, climbing with friends and students on weekends, Bob summitted over 300 traditional mountaineering peaks located in Southern California, Mexico, the Sierras, the Cascades and Switzerland. In the early 1970s his first alpine peak was Bear Creek Spire in the high Sierras. Upon retirement from a 30 year business career and moving to Bend Oregon in 1993, Bob proposed and taught, in the Adult Extension Division of Central Oregon Community College, a thirty hour Basic Mountaineering Training Course to several hundred students, adding classes in Alpine Rambling, Light and Fast Backpacking, Snow Climbing, Wilderness Trail Construction and Maintenance, Map, Compass and GPS Together and other classes. He mentored visitors to the Three Sisters Wilderness as a Volunteer Backcountry Wilderness Ranger for three summers in the late 1990s. He co-founded and served as President of Cascades Mountaineers Alpine Climbing Club in Central Oregon. Recently, he has led free field Clinics in Crevasse Rescue, Ice Axe Self Belay and Arrest, Technical Climbing of Steep Snow Slopes, Self Belayed Rappelling, Snow Bivouacs and Camping and Navigation Noodles where students become lost and found. His fee Classes in Staying Found with Map, Compass and GPS have been presented to about 80 students in 2006, with more attending his Classes in Winter Mountaineering and Technical Snow Climbing. 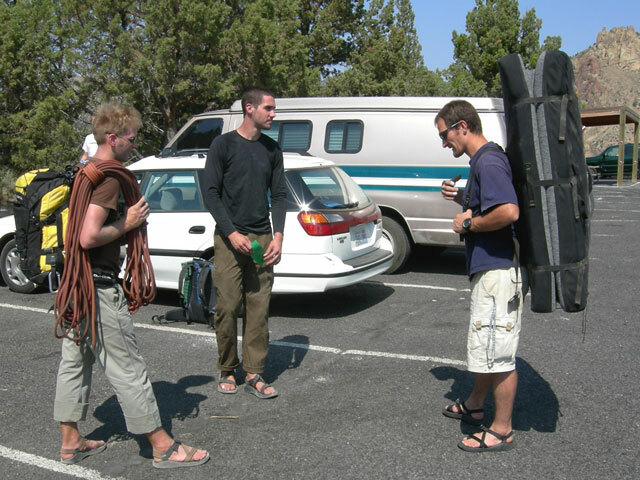 In 2002, Bob Speik started a website called www.TraditionalMountaineering.org founded on the "premise that 'He who knows naught, knows not that he knows naught', that exploring the hills and summitting peaks have dangers that are hidden to the un-informed and that these inherent risks can be, in part, identified and mitigated by information, training, interesting gear and knowledge gained through the experiences of others." Bob's website has grown and become a resource world-wide, often exceeding 500,000 "hits" a week with more than 50,000 pages read each week through more than 6,000 hosts in more than 50 countries around the world with as much as 7 gigabytes of data transferred. As can be seen from his website, Bob is still summitting peaks and mentoring people in what he calls Traditional Mountaineering. 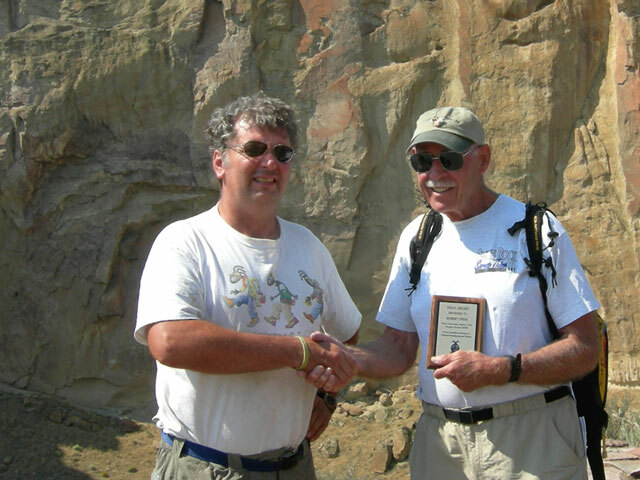 AAC Oregon Section Chair Bob McGown and Bob Speik who is sporting a traditional 1994 Smith Rock Spring Thing T shirt. 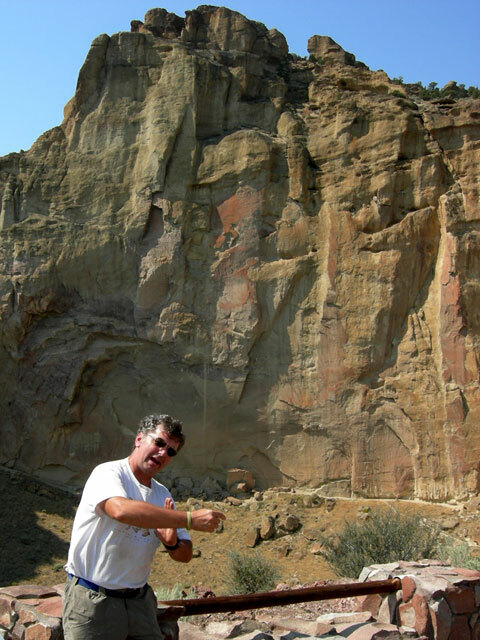 Picnic Lunch Wall and on Monkey Face and others at Smith Rock. Four Basic Responsibilities of the Wilderness Traveler and the Ten Essential Systems. Is long distance backpacking part of "traditional mountaineering"? How did you become interested in traditional mountaineering techniques? What is traditional slacklining or highlining? What are some of the comments you have received? Who were the notorious Vulgarians? How was top rope climbing practiced in the 1970s? What is a Whillans sit harness? What is a dulfersitz rappel? How do I self-belay a rappel? How accurate is the inexpensive hand-held GPS today? What are some good Central Oregon Geocaches? Which GPS do you like? Which Compass do you like? How can I learn to use my map, compass and GPS?